"Too intimidated to become artists themselves, very often too low in self-worth to even recognize that they have an artistic dream, these people become shadow artists instead." She states that often these folks go into advertising, art education, law or even medicine because, "Art won't pay the electric bill." She continues by stating that many of these "shadow" artists are frustrated with their career choices and would rather be artists. Of course, Cameron would label me a shadow artist. That's because I was in advertising for 25 years and I've taught drawing and painting for 10 years. To be perfectly honest, I never regretted either decision. Maybe it's because throughout my life, I've spent most of my free time creating some form of art. I always thought I had the best of both worlds. Many artists have had to follow the same path to make ends meet. It's just a reality of life. We're all in the same boat (unless we have a wealthy family or patron), and we do our best. One artist in particular followed the "shadow" way, earning a living whatever way he could. 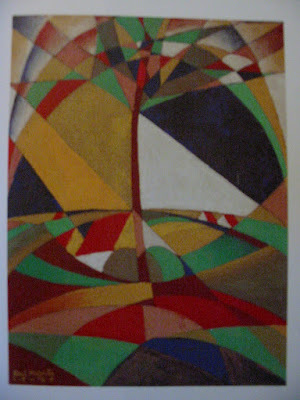 But all along, he also created his own art and in my opinion, was one of the best in the 20th century. 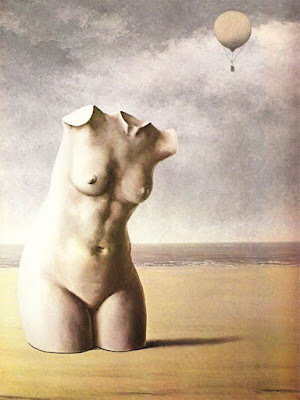 I'm talking about the Belgian Surrealist, Rene Magritte (1898-1967). He was a graphic designer, a theater set designer, owner of an ad agency with his brother and even a visual forger. 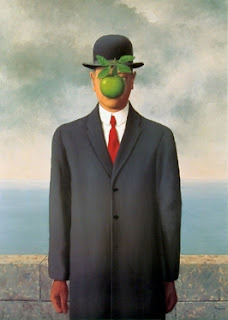 Eventually, he became a major player in modern art, influencing pop art, minimalism and conceptual art. 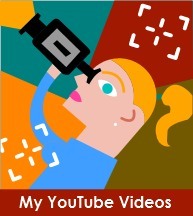 The name may not ring a bell, but his artwork will (see below). 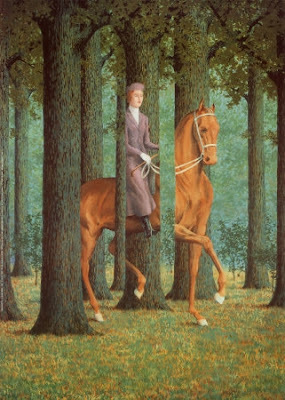 What's most interesting about Magritte is his transformation. He went from very abstract to being an artist of reality vs. illusion. He liked to repeat themes over and over again as well as attempt new methods. I simply love looking at his paintings and collages. They are all delightful. 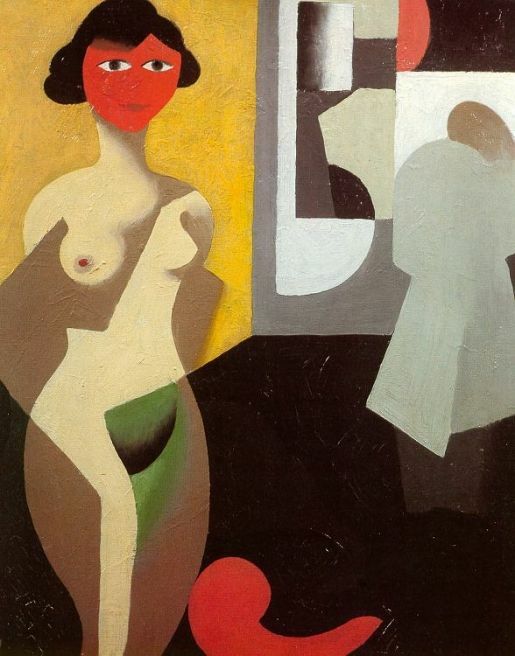 When you look back through his early works, you can see that he was heavily influenced by Cubism and Futurism, early 20th century art that placed traditional art upside down (sometimes literally). Here are some of his early works dating from 1919 to 1924. Notice the Cubism influence. 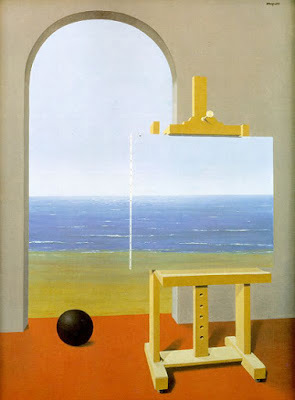 Around 1925, Magritte's style began to change. 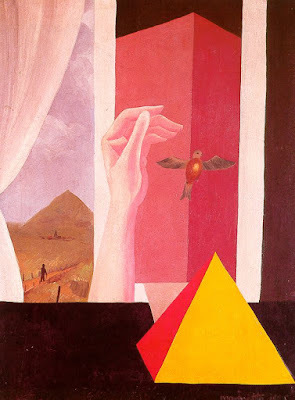 The Window, done in 1925, demonstrates that he was still using Cubism but he added a window, a curtain, a hand and a bird, all of which will appear in future work. In that same year, you can actually see how he was transforming from Cubism to Surrealism. 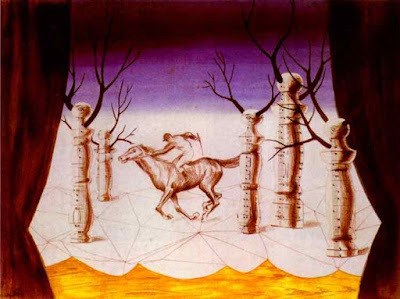 His Nocturne work begins to show his emphasis on light and dark, the introduction of the bilboquet (toy), the web on the floor and again, the curtain and bird. 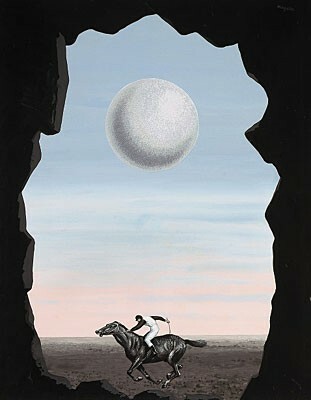 In 1925, Magritte also created what he considered his first Surrealistic piece, The Lost Jockey (Le Jockey Perdu). He repeats this theme several times, including in 1925 as a collage and then again in 1926 in gouache on paper (see below). 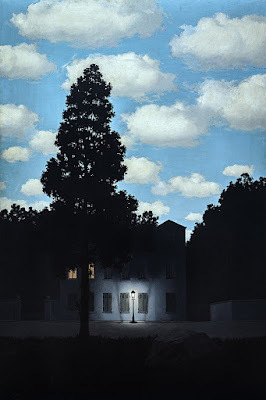 Fortunately for Magritte, he was able to secure a contract with Galerie 'Le Centaure' in Brussels from 1926 to 1929, which gave him the income he needed and the opportunity to live in Paris for three years with other Surrealists. 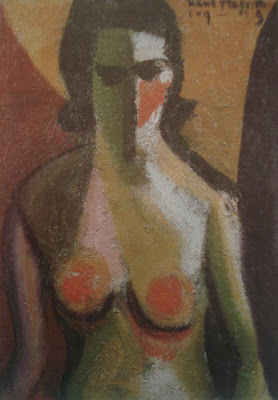 But once the gallery closed its doors, he was back in Brussels by 1930. He returned to advertising and even opened up his own agency with his brother--both of them were able to earn a living wage. Hooray! Magritte used the clothed face theme several times. Some believe it was related to his mother's suicide during his youth, but there is no proof of that. How people reproached me for it! 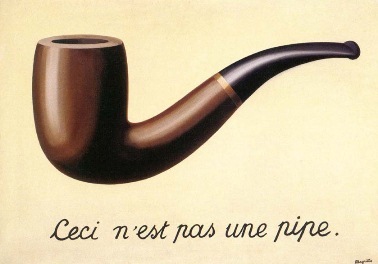 And yet, could you stuff my pipe? No, it's just a representation, is it not? 'This is a pipe', I'd have been lying!" 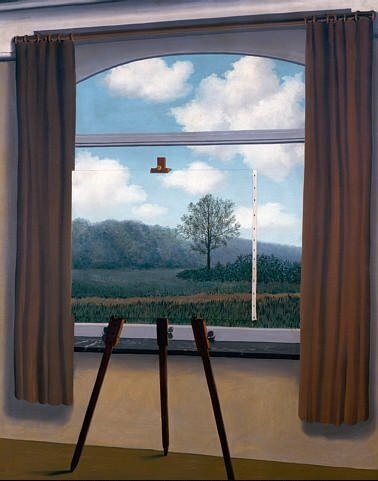 Look closely, is this a painting of a painting in front of a window? Yes, it is! So cool! Again a painting of a painting in front of a door? One of my favorites. During the German occupation and after the war, Magritte delved into different periods, one was his Renoir period, where he created colorful paintings, and his second in 1948 called his Vache period, where he painted similarly to Fauvists. 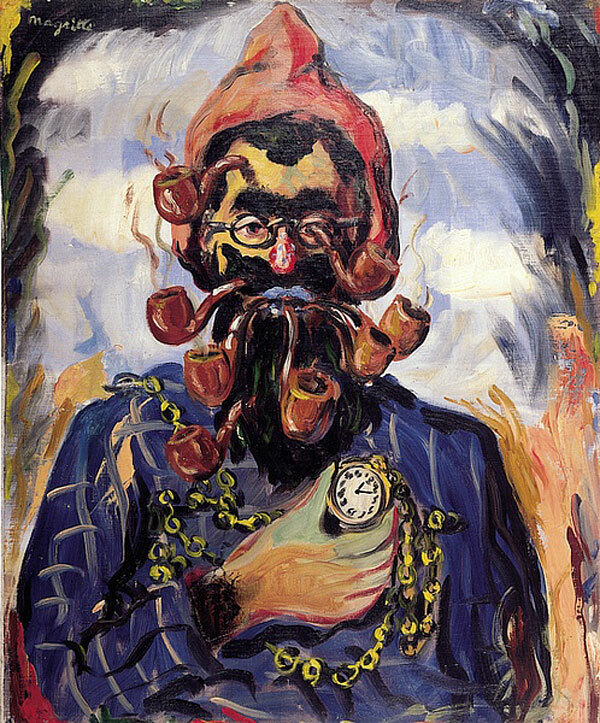 I like his Renoir period the best. 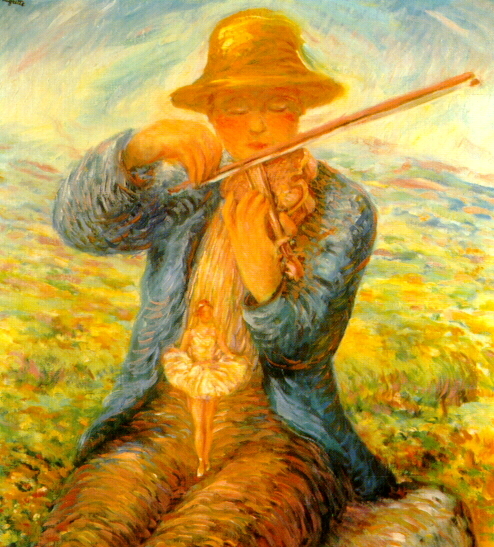 Notice the ballerina below on the fiddler's lap. Every one of his paintings reminds you to look closer than normal. After the war, times were hard on everyone, and it is said that Magritte and his brother engaged in creating some forgeries, including works by Picasso, Braques and Chirico, as well as the printing of forged banknotes. Hmmm. I wonder what "shadow" he was working under then? 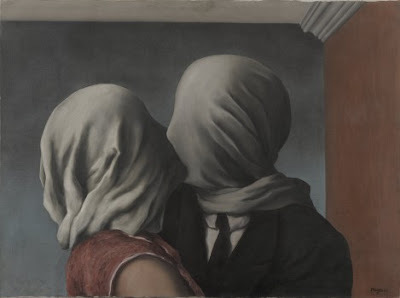 By the time the 1950s came along, life was better, and we see the modern day Magritte come alive. 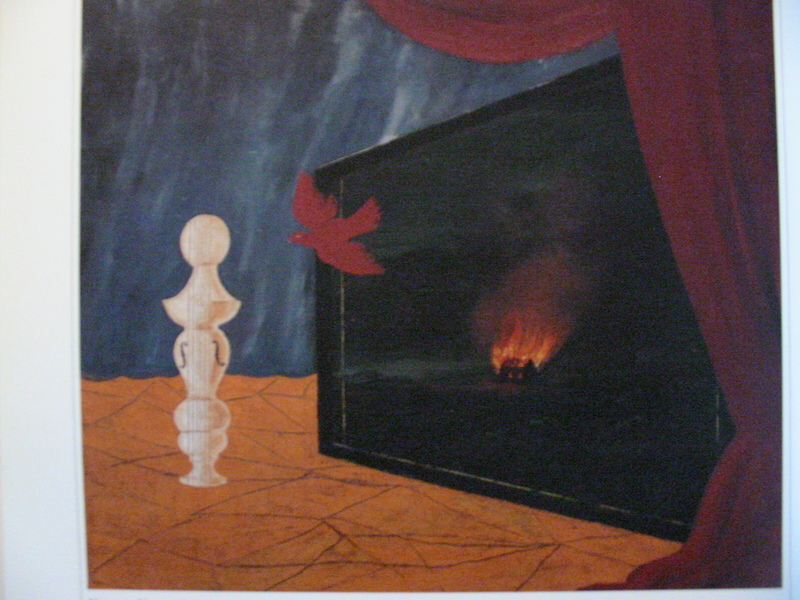 This is when his work became popular up to and throughout the 60s. 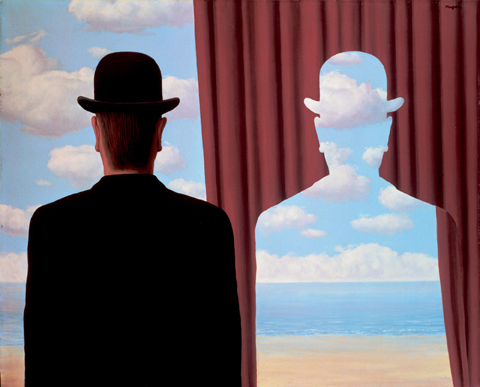 Unfortunately, he died in 1967 of cancer at only 68 after producing over 1,000 paintings (an amazing shadow artist if you ask me). The following paintings were done in those last couple of decades and are definitely some of my favorites. 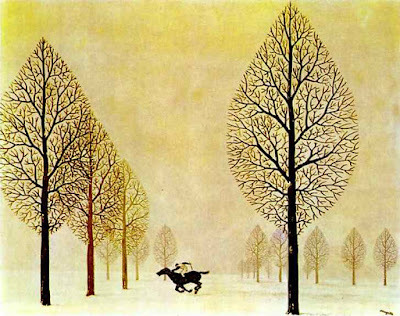 I was truly fascinated by his work as a child. 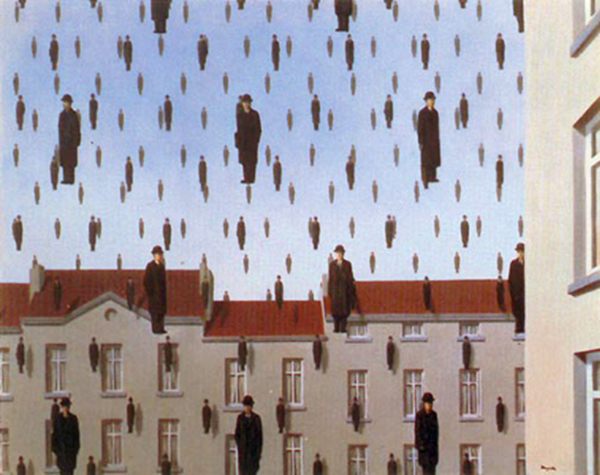 The above theme is repeated again and again by Magritte. 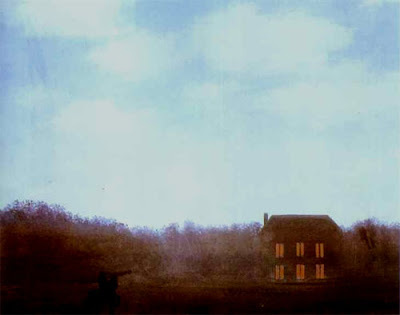 Notice the sky is daylight and the house is set at night I truly appreciate the contrast and love the creative touch. I hope you enjoyed this visual journey of Rene Magritte's work. I sure love to revisited his stuff over and over again. If you want more information on this artist, you can go to Mattesonart, where there is a complete and thorough biography. New studio classes begin the first week of March. 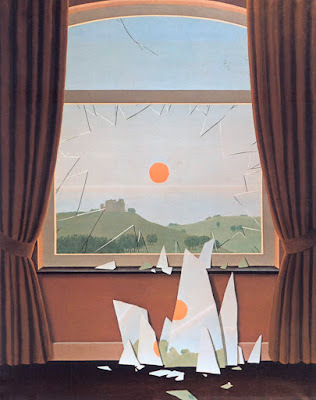 In one of my recent classes, a discussion cropped up about that point in a painting or drawing where everything looks awful. No matter how hard you try, things just aren't falling into place. I call this the muggly-ugly stage. Granted, it doesn't happen with every project, but it does pop up enough to make you wonder if this ever happens to anyone else. Well, the answer is yes. If the arts were simple, everyone would do it. The hard work comes from being able to overcome the challenges that we meet, one of which is how to fight the muggly-uglies. Give yourself a break. When faced with difficulties, simply get up and take a walk, make yourself a cup of tea or coffee, call a friend or pay a bill. In other words, stop what you're doing and occupy your mind with something else. Have you ever tried to come up with a name or word and it's just not forthcoming? Then, you get yourself busy with something and voila! it comes to you. I'm not sure there's a name for this phenomenon (if not, there should be), but it's totally amazing. That's what you want to do when you take a break--have a moment to think about something else. When you return to your painting or drawing, you may feel afresh to start again. Go to a nearby mirror. Here's a trick I learned from my former drawing instructor. 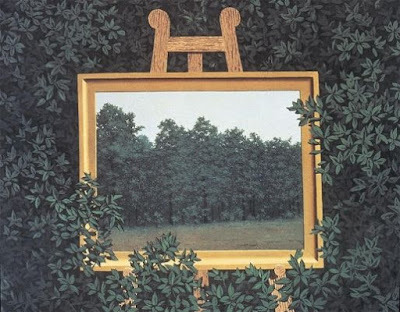 To get another look at your painting or drawing, go to a mirror, place your project to the side of your face and peer into the looking-glass. Very often the mirror becomes what's called a third eye. Interestingly, you can often see what's going wrong. Get some distance. Usually when we are working on a project, we're just too close to it to see if indeed it's bad or good. I can't tell you how many times, I have students in my classes or workshops who are struggling with their work and from my viewpoint everything is going along swimmingly. So I take their piece (with permission) and hold it up for them to see. Almost every time, the student will suddenly be surprised (and relieved) to see that the work isn't that bad after all. Sometimes I think our opinions, when we're struggling to get the object down on paper or canvas, is highly emotional. We're just too close to the project. That's true for lots of issues in our life, not just painting and if we give ourselves some distance, our perspective changes. So take my advice, prop your project up on a wall or easel and step away from it--perhaps a foot or so. You may find the piece isn't as bad as you thought. If it is, then follow the next step. Put it away. Similar to taking a break, another option is to stop for the day. I've used this method time and time again. It works. Back in my advertising days, I had to write a lot of ad copy. Sometimes as I planted words on the page, I'd be saying to myself, "This stinks!" That's when I knew I had to put the project in the desk drawer and work on it the next day. And frankly there are times when the eye and mind aren't working well together. That's when we must put our work away and call it quits for the day. Lean on a pal. I've been drawing on a daily basis for over 16 years. It's very seldom that I miss a day--perhaps because of illness or traveling. So you'd think I wouldn't have the muggly-uglies, but I do! When this happens, I'll stop and ask my husband for any suggestions. He's that third eye I was talking about. Most of the time, there really isn't anything wrong. I just need to take a break. But other times, he does see something that I was blinded to. Although a word of warning is needed here--pick someone you know will be honest. Your frustration will only increase if you choose someone who is not trustworthy. Consider your state of mind. 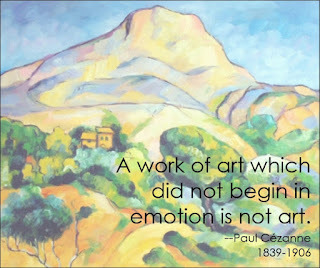 Frequently, drawing and/or painting will send me into a fabulous place, I call the zone. That's where all my troubles seem to melt away. I love it. But when I'm truly troubled, there's no amount of art that will help. At that moment, I just have to give up in order to face the underlining issue. I usually call a friend. They can be cheaper than a therapist. Last but not least: know that everyone experiences this! I seriously don't know any artist (or writer) who doesn't go through the muggly-uglies. It's part of the creative process. It's what others call the hills and the valleys of life. 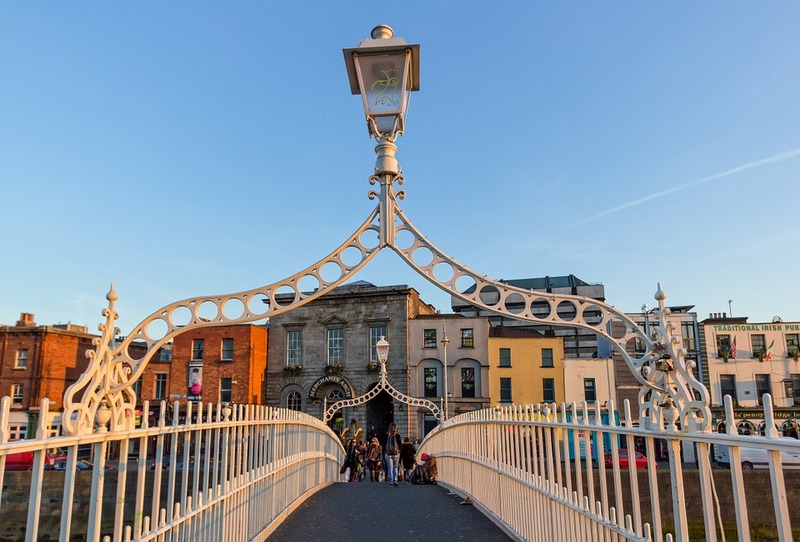 Please note: The above post is for the artist who is not faced with incredible deadlines, such as a graphic artists or one who has taken on a commission. In that case, I still recommend giving yourself some distance and taking frequent breaks.